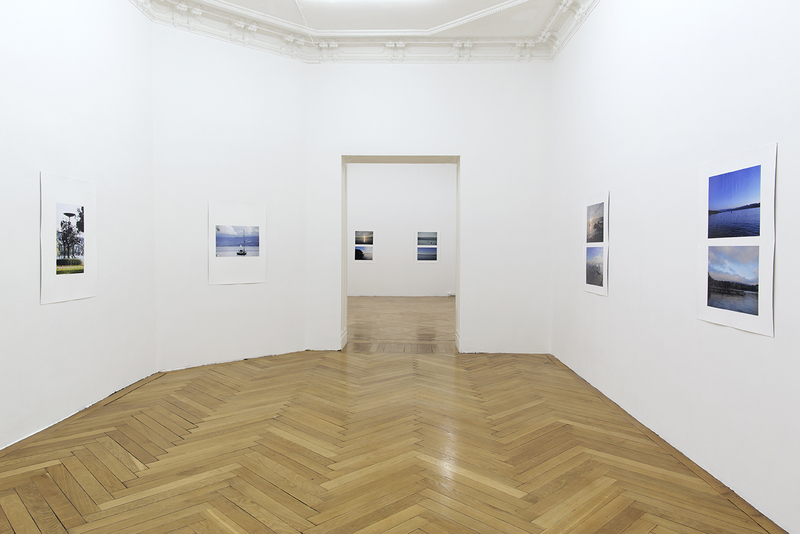 For his second solo show at Société Berlin, Kaspar Müller presents 28 collages of photographs mounted on cardboard entitled “The Weather in Zürich”, 2013–2014. Size: 100 x 75 cm, each. So, to get started, should we talk about travel or about circulation? 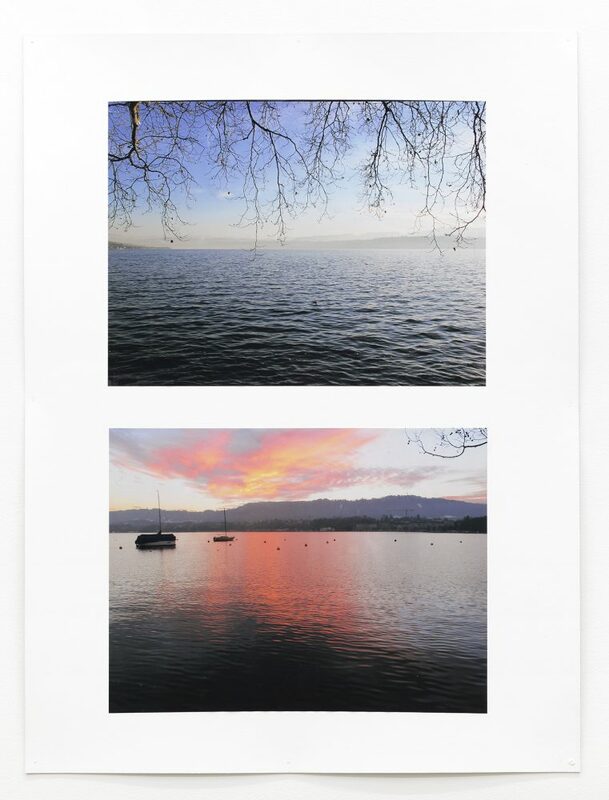 When it comes to these images of Lake Zürich, it’s mainly a matter of place. A very specific place. 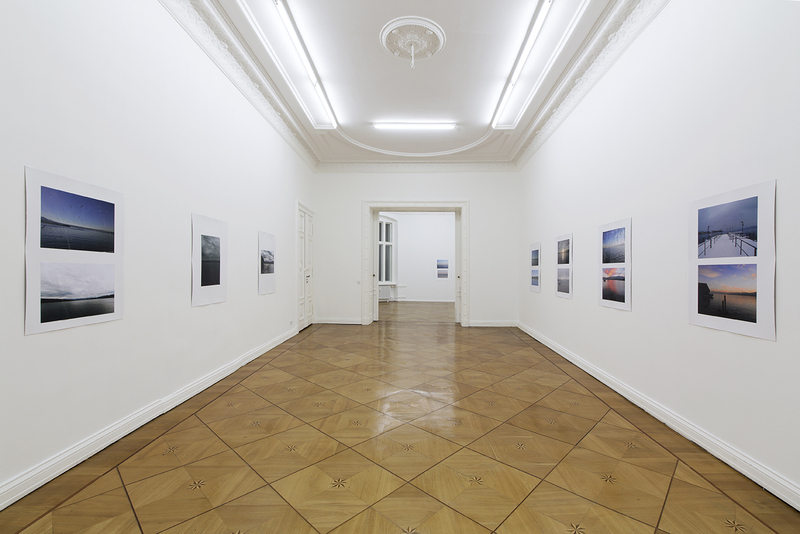 When you see the images, you won’t be in the same place, because they were all taken in Zürich, and the exhibition of the photos is in Berlin. So you would have to travel, even just in your imagination, to a specific destination. 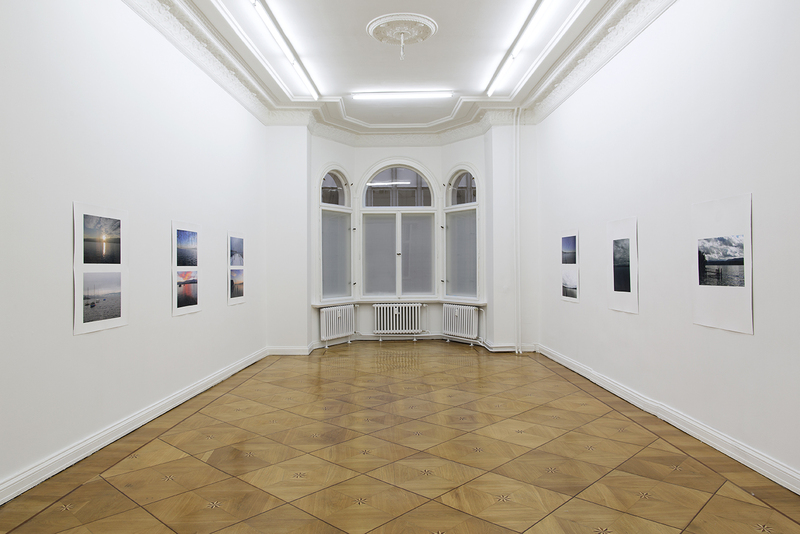 It’s not that much about traveling in general, but about one place, which might include traveling as a way of getting there – but then, that place has in a way traveled to Berlin. 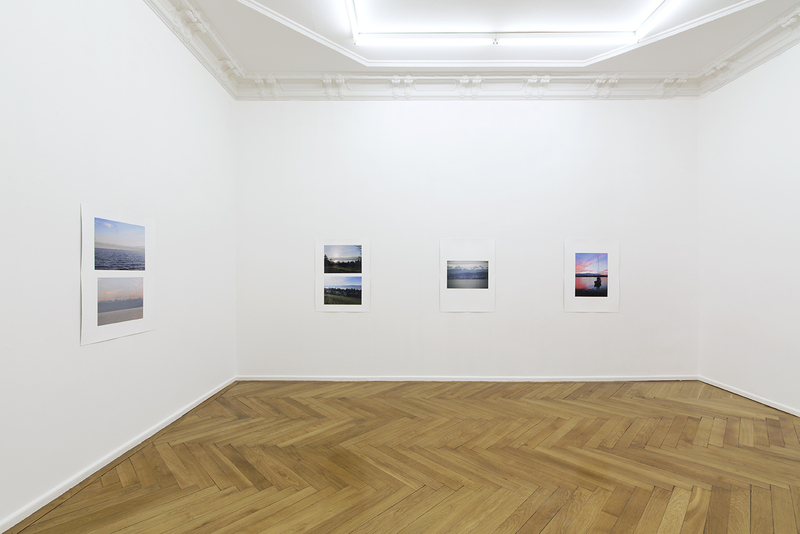 The lake is portrayed in a number photographs, unique moments captured over a year, over 4 seasons, in different weather conditions. What might follow could be called traveling, maybe, on a metaphoric level at least. Like memories don’t arise until they’ve been reflected by something, mostly something superficial, like a texture, a picture, a sound, an object, or a scent. I want to use the lake and the pictures first of all as a vehicle. Whether something breaks or reflects on it or just runs into emptiness and oblivion. At first glance, these works have a potential that could be compared to that of postcards. Could you say something about these photos, which you’re calling The Weather in Zürich – in relation to the works you’ve done in the past about a hat? I’ve done three projects with the hat: It started as a costume for an actor in my film about a specific place, or rather two places, edited together into one ideal place: Colmar & Strasbourg. There’s a strong parallel to the idea of the mise -en -scène of an existing place, to use it as a ready -made stage, not just with the facades but also to avail oneself of its “image” and reputation – though the lake is an ’empty’ stage, a stage for the landscape first and foremost. 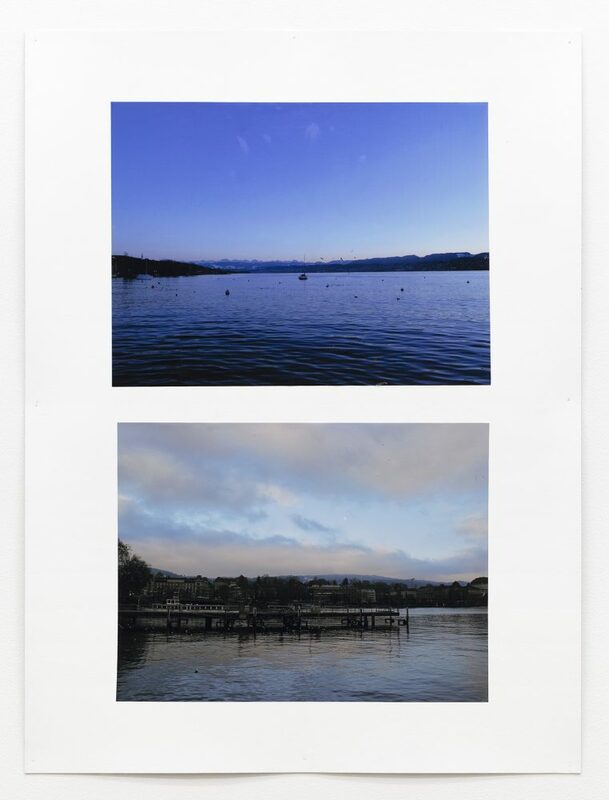 In my photos of Lake Zürich, there is no narrator, no guide measuring and mediating the place, like there is with the actor in the film Colmar & Strasbourg. The protagonist is the lake itself. Also, the photos are static, captured moments, nothing moves. In the film, motion is very important – not just as the medium, but also the very slow flow of the actor (with the hat) on the ships trough the canals of Colmar and of Strasbourg, passing by the facades of buildings. Lake Zürich seems immobile, heavy. The rivers in Colmar and Strasbourg never stay put, the water passes into the sea somewhere in Holland. Lake Zürich is a basin, it stands still. The actor was wandering through places of conserved and mediated memories and historicized education, instructed by audio -guides, through a self -inflicted and vain mock Atlantis, lost in debates and self -portrayal, feeding from the past, almost like a facade built after its own cliché. It’s also a different way to recollect something when it’s mediated. The big, eye -catching hat had its origin in a promotional hat from Heineken, which I re -tailored with different fabrics. It made the actor look like a drop -out magician hippie lost in a touristy stage of colorful trippy half -timbered facades. The actor was constantly walking, or the ships were moving, so there was never a still moment. While the touristic facades in Colmar and Strasbourg look damned, rotten, a civilization falling apart, almost without any nature, the lake looks like a utopian place, a treasure island, a safe heaven where nature and civilization have developed a symbiotic relation. The trees on the hills around the lake in Zürich have been cultivated so that one can’t see beyond the city, can’t see the rest of the world behind the green edges. A cultivated utopia. Zürich is a very strong and powerful place and, compared to many of the other places I’ve been, it still seems like an exotic place. The lake is so clean, it’s actually classified as drinking water. The lake also has a symbolic value, of course, a basin contains things under its reflecting surface that can’t be seen. Which is also a fact. It’s like a mirror in which you search for deeper things, but you just reflect yourself. In this case, the whole landscape/sky is reflected. As for the images, they’re often divided by a horizontal line, almost mirroring that scene.